SiteW offers you a brand new service: you can now add your Facebook images and videos to your website, in just a few clicks, and enjoy even more free storage to create your website! In order to make your experience as secure as possible, SiteW can’t modify the access rights of your Facebook files. However, when you select a file to add it to your website, you are immediately notified, if the privacy status does not allow publishing them. For safety reasons again, SiteW doesn’t reserve the right to delete, modify or create any file on your facebook account. 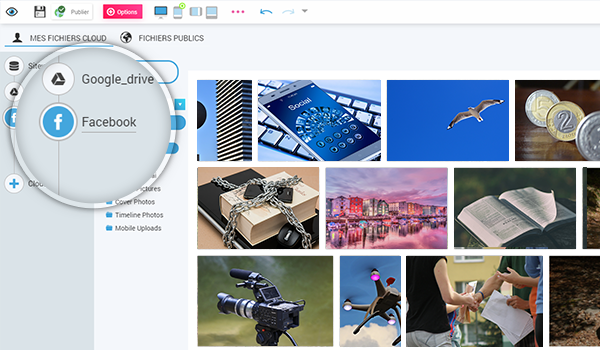 Every Starter, Premium and Pro user will thus be able to enjoy more free storage for their website creation. How to access your Facebook files? You can manage everything from the SiteW file manager: you can access the service by clicking on the Facebook icon that appears under the My Cloud files tab. If your browser is already logged in to your Facebook account, the connection is automatic. Otherwise, a connection button is available. Once the connection between Facebook and SiteW is active, all your files will be displayed. You can select them in order to add them to your website. To conclude, SiteW always offers you more possibilities for your website creation: we give you an easier management of your files and even more free storage. Get to your keyboard!